If you’re a boy mom, like me, inevitably this has happened to you. You wake up in the middle of the night to go check on your kids, or to adjust the thermostat, and BAM out of nowhere you have this stabbing pain in your foot. What did you step on? Oh yeah, one of the 5 million Hot Wheels cars lying around. For me it happens more often than you think; even in the middle of the day. You see, my boys (and their dad) have a little bit of a car problem. ; to the tune of almost 400 of them! (And my oldest isn’t even 3 yet.) While I don’t mind buying them for them, (paying $.97 for a car is much better than paying $20 for a video game or other toy) I don’t really enjoy having to tip-toe around my house every day trying to avoid their evil murder plots. Ok, Ok, I know they aren’t trying to kill me, but sometimes it seems that way with all the strategic places they hide those things! About 6 months ago I told my husband we had to come up with a better way to clean up the cars. At that point we were throwing them in a square crate, but that wasn’t working because they were always falling out the holes as I was moving them and the cars were getting broken. And if the car wouldn’t drive how it was supposed to a meltdown quickly followed. I knew their had to be a better way. One day while we were at WalMart he saw these thread organizers. They were the answer to my prayers! Since we had a car in the cart, of course we have to buy one every time we go to the store, we opened the package (making sure not to damage the barcode so we could still pay for it) and it fit perfectly. We bought three that day and quickly filled them up. 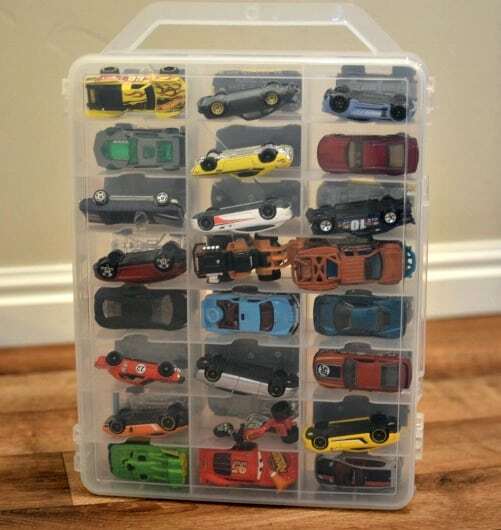 These containers are perfect because they are just the right size to fit the majority of Hot Wheels or Matchbox cars and because they have one space that is twice as wide as the rest we are able to fit the trucks in there too! Each box can hold 48 cars if you place them one per compartment, or up to 96 if you double them up (which we’ve done before). These car organizers are super sturdy too, they’ve been dropped, thrown and jumped on and they still are holding strong. With the handle on top they are super easy to carry too! One of the added benefits to having the cars go in these carrying cases is that the boys actually don’t mind cleaning their cars up now. They like being able to put the cars in the “right” spot. And you better believe they have a system of which car goes where. Now if only this want to clean and organize survives through their teenage years! So if you are having the same frustrations as me when it comes to cars everywhere, go buy 2 or 3 (or 6 or 7 in our case) of these Thread Organizers and keep your mind, and feet, happy. We have one of these and I totally love it! Yay! They make clean up so much easier don’t they?! Thanks for the tip! We so need this. 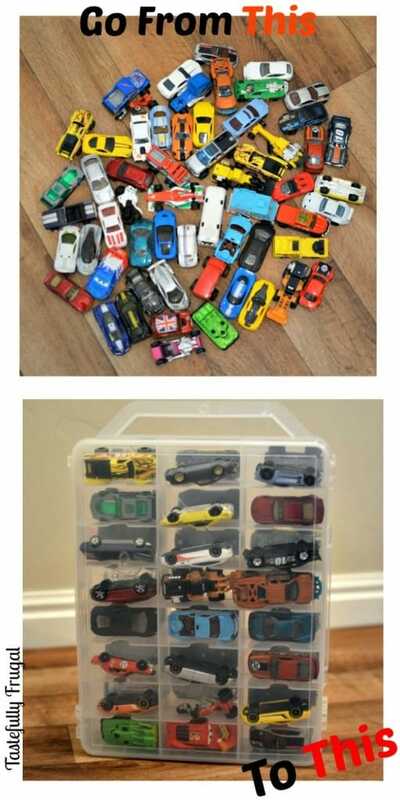 My boys have a lot of little cars here and there and it’d be so nice to have it organized in one place! These are definitely a sanity saver and makes it so much easier to keep things clean! Thanks for stopping by Becky. Love it! That is so genius! 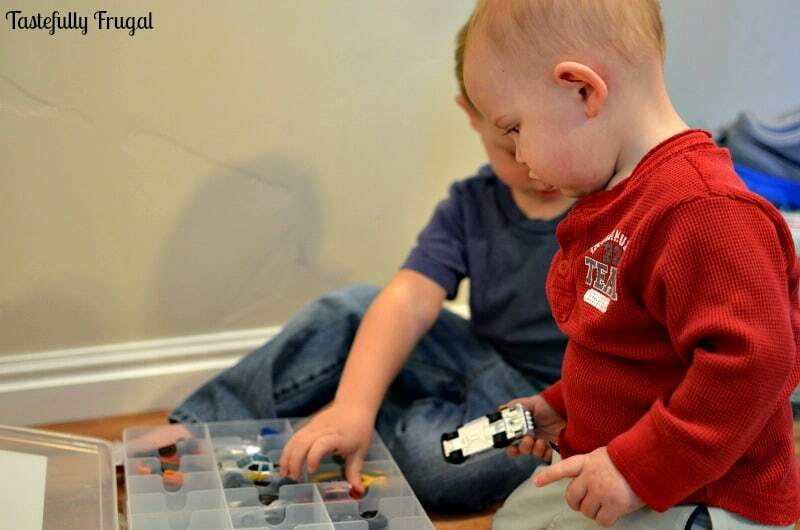 I am a girl mom with similar problems, Legos and barbie accessories….oh the pain! 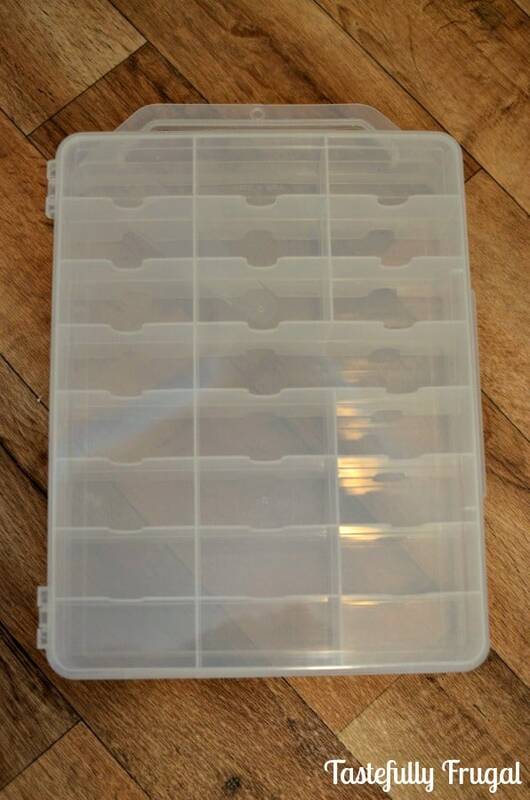 I have one of these boxes for hair accessories, I need to try it for barbie stuff. Thanks for sharing. That’s a good idea…hair accesories! I may have to go buy one for me too now! This is brilliant, Sydney!! Such a great idea! Thank you Amy! I can’t stand things not being organized… This was good for my OCD mind! I have three boys so this is brilliant! Thanks! Thanks Heather! They are definitely a sanity saver! Awesome! I need to get one of those! My son’s cars and trains are just everywhere! Thank you Danica! Let me know how they work out for you!! This is a great solution, my two boy’s have soooo many cars. This also would be a great way to take cars on long trips. They can bring some cars and not have a big mess. Thanks Emily! We took two boxes on our road trip to California and it worked out great! They could get the cars out they wanted, close the lid and drive the cars on top of the box. This is great! I will need to get one of these once we have all those little toy cars for our little guy as well. 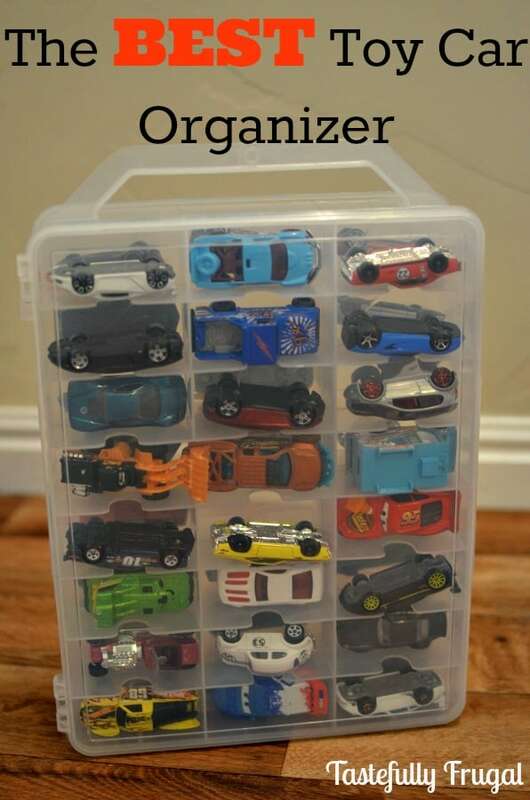 Now the trick is, how often are you putting the cars back in the organizer? Thanks Kim! My boys are very particular about what cars go where and have developed the same ocd cleaning schedule I have so, luckily, they clean them up and put them away every day! Fingers crossed these habits continue through their teenage years. I hope they help keep things organized for you Mel. I know it’s crazy where kids find to hide things. When we moved last year I found over a dozen cars in the most random places. That doesn’t include the half dozen or so behind the fridge!! You are brilliant! I am using this one! Ah thank you so much Christy! I give all the credit to my hubby! I have a little boy with a lots of hot wheel cars too! I have tried everything. Hot wheels does hurt when you step on them . I love your idea but I don’t know if he will put them back into the organizer. great idea Sydney!! thanks for sharing! Rebecca recently posted…Meet Crocketts Cove! Thank you Rebecca! Thanks for visiting. We SO need one of these organizers! 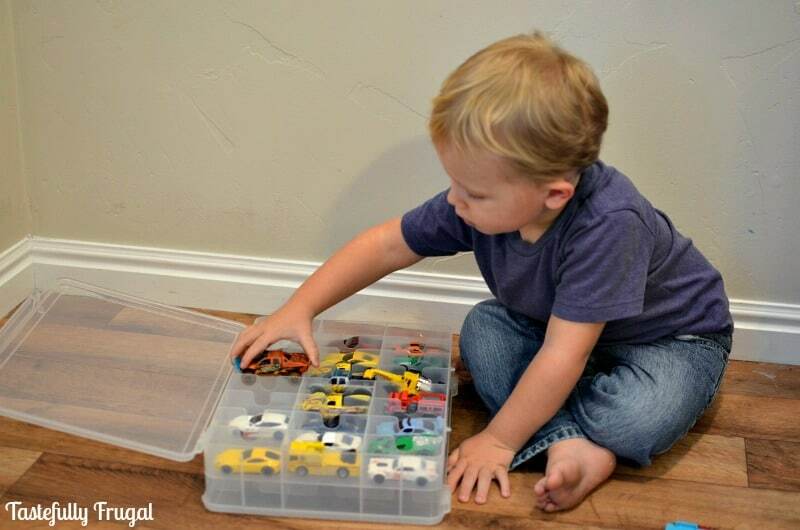 My son has cars everywhere… I try to keep them in a basket, eek never works, lol! That’s what we were doing too and it was so messy I love these! Thanks for stopping by Heather! Gentle Joy recently posted…Wonderfully Easy Peanut Butter Bars! where can we purchase this clear car organizer?